The Heartland Institute, a far-right climate change denying “thinktank” has put up a series of billboards so disgusting, so vile, that I find it difficult to find words to tell you just how disgusting and vile they are. Actually, “a solid majority” of Americans think global warming is real. They’re the radical fringe? As usual, the global warming deniers accuse others of doing what the deniers themselves are guilty of. Also, the “murderers, tyrants, and madmen” line? Nice, Heartland, nice. Rhetoric like that really makes you look sober, sane, and willing to discuss things rationally. 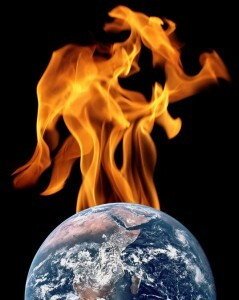 The Earth is warming up. The rate of warming has increased in the past century or so. This corresponds to the time of the Industrial Revolution, when we started dumping greenhouse gases into the atmosphere. Greenhouse gases warm the planet (hence the name) – if they didn’t we’d have an average temperature below the freezing point of water. Carbon dioxide is a greenhouse gas which is dumped into the atmosphere by humans to the tune of 30 billion tons per year, 100 times the amount from volcanoes. And finally, approximately 97% of climatologists who actually study climate agree that global warming is real, and caused by humans.